Photo above used with great thanks to Bobby_emm; photo below left used with great thanks to flicka23. The King Cake is a direct US descendant of the French gateau des rois (not to be confused with the gallette des rois, which has a puff pastry base and frangipane filling, as opposed to the filled-brioche style of what became the King Cake) from France, part of the feast of the Epiphany. Why the royal name? Well, it takes its name from the three kings of biblical lore, going along with the idea that the twelfth day of Christmas, when the three kings arrived bearing gifts for the young Christ, there was much celebration and merrymaking to be made. Afterward, part of the tradition became to crown a "mock" king of celebrations, the king being whoever came across a trinket (originally a bean) in the cake at the festivities. The bean custom seems to have been borrowed / inspired by the Saturnalia festival of the Roman Empire. The Epiphany celebration became a celebration of the new year, a fruitful harvest, and healthy year ahead; it is also a forefather of the modern Mardi Gras, a necessary bit of excess and evil before the solemn days of Lent. Really, the New Orleans version of the cake embodies the celebration and excess that is Mardi Gras: the twisted-bread / brioche style cake is frequently filled (and in our opinion, at its best!) with rich cream cheese or praline, and topped with sugar icing in traditional purple, green and gold carnival colors which represent justice, faith and power (respectively) . The finished product is extremely colorful, rich, and extremely sweet. These days, the treat is so popular that some people in the New Orleans area have "king cake" parties every week (an excellent tradition!). But back to that little figurine: why is it a baby now, rather than a bean? Some say is to represent the young Christ of the epiphany; however, we like this explanation so much better: "a local bakery chain got a large shipment of such plastic dolls from Hong Kong very cheaply in the 1950's and had to use them up and there is no more signifigance than that." Who knows the real truth, but hey, it makes a good story. But regardless of the meaning of the baby, they're still highly covetable little miracles: just as with the older versions of the cake, whoever finds it in their piece is declared the king or queen of the party, and gets to wear the crown with which the cake is often served. And while it's good to be king or queen--royal duties will include leading the drinking and merriment, and the ability to command others to act upon your whim--don't despair if you don't get the coveted bean or baby. Aside from saving precious tooth enamel, the king or queen is frequently appointed to either pay for the night's drinking, or buy the cake and host the party the next time. Long live the king, indeed. Want to try making your own King Cake? Well, it seems like a serious undertaking, but we spied an authentic recipe at nolacuisine.com. Vegans need not despair; Melisser the Urban Housewife suggested a vegan recipe too, which can be found at pakupaku.info. Thanks Melisser! Still want more? 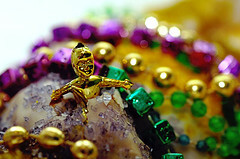 Why not check out Cakespy's King Cake painting (complete with mini baby! ), now available at jessieoleson.etsy.com!